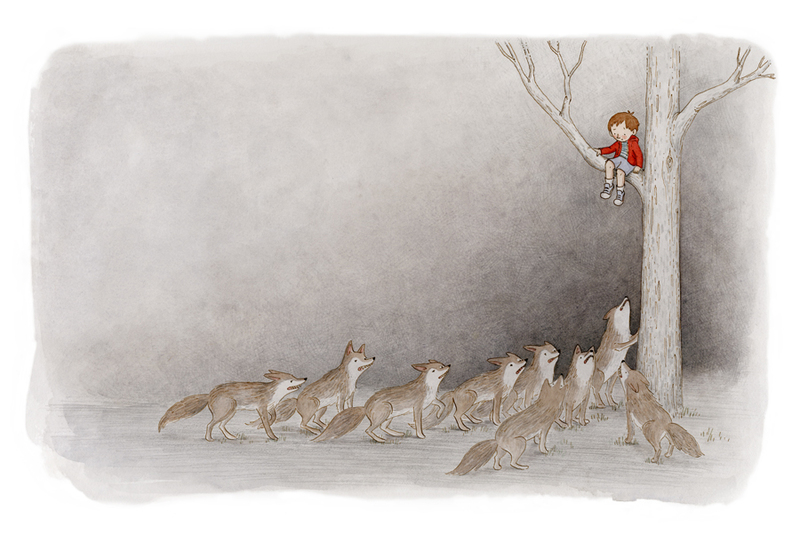 It’s the first Sunday of the month, which means a student or just-starting-out illustrator here at 7-Imp. 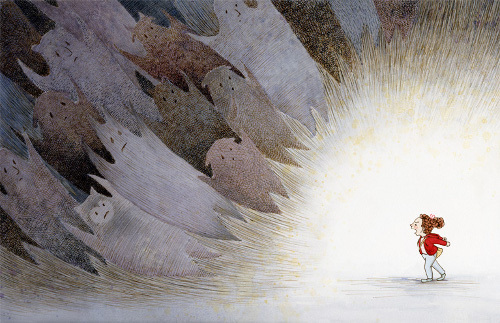 Today, I welcome Brooke Boynton Hughes, who has already illustrated one children’s book and is working on a handful of others now but is still relatively new to the field. It’s a pleasure to share some of her artwork today. Let’s get right to it, especially since Brooke gives us a few words of introduction. 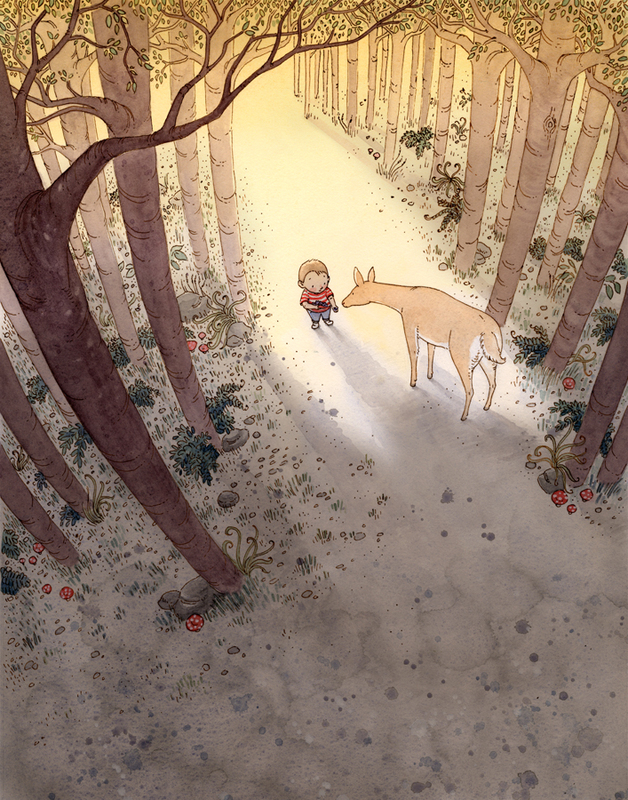 Brooke: I’ve wanted to illustrate children’s books ever since I was little. 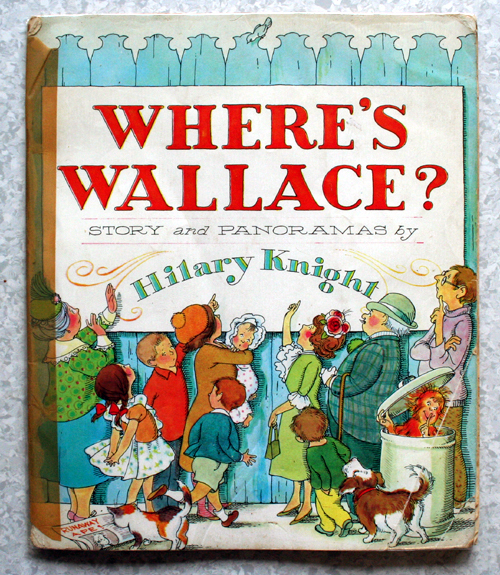 When other kids my age were moving on to middle-grade books, I was still poring over picture books. 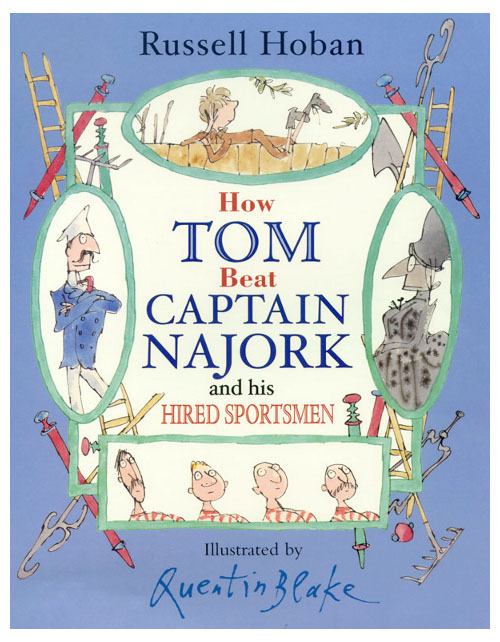 I loved reading, but I was especially enthralled by visual storytelling. As a kid, I spent a lot of time drawing and becoming engrossed in whatever visual world I was into at the time. There were a couple of years where I drew almost nothing except for tree houses, and there was the year of underground rabbit houses. The imagined worlds that I created in my drawings felt really real to me. I guess I loved, and still love, residing in imagined worlds. I attended Colorado State University where I earned a BFA in printmaking. In 2006, I received an MFA in figurative art from the New York Academy of Art. I concentrated on drawing and relief printmaking and made a lot of woodcuts that focused on folktales. 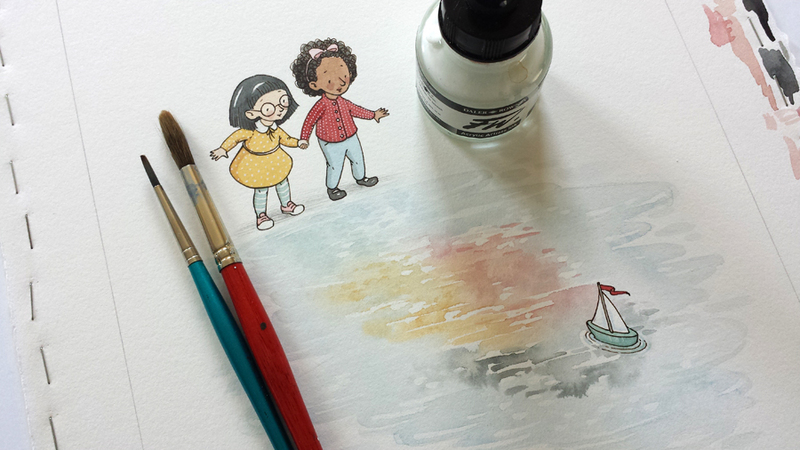 Today, I use pen and ink and watercolor on Arches 140lb hot press watercolor paper to create my illustrations. In 2005, while still in grad school, I joined the Society of Children’s Book Writers and Illustrators and began attending their conferences. 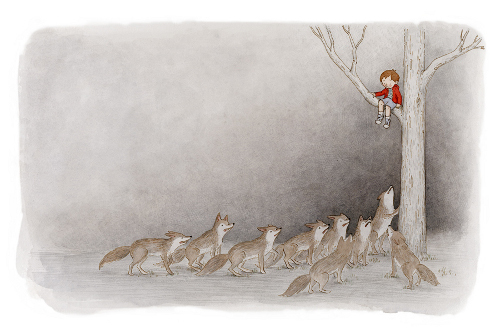 I’ve learned so much from SCBWI and have met most of my close friends at SCBWI conferences. 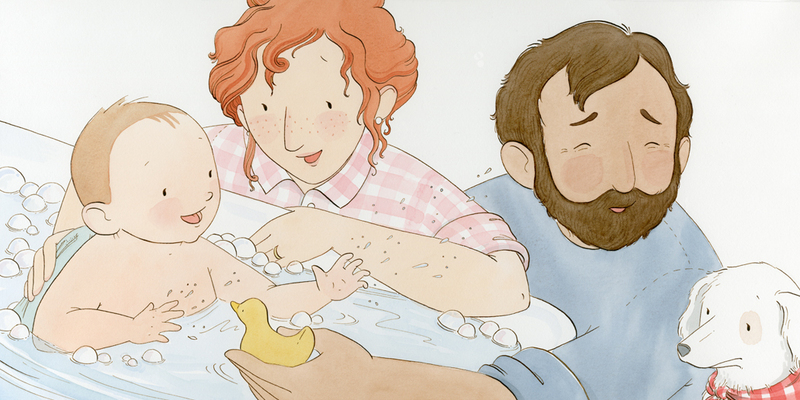 This summer I’ve been working on putting the finishing touches on Baby Love, written by Angela DiTerlizzi and published by Beach Lane Books. Baby Love [pictured below] will come out next Spring. I’ve started on the illustrations for the second book in a middle-grade series, called Cupcake Cousins. 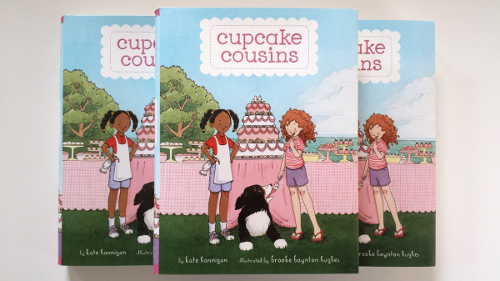 The first Cupcake Cousins book, written by Kate Hannigan and published by Disney-Hyperion, came out at the beginning of May. 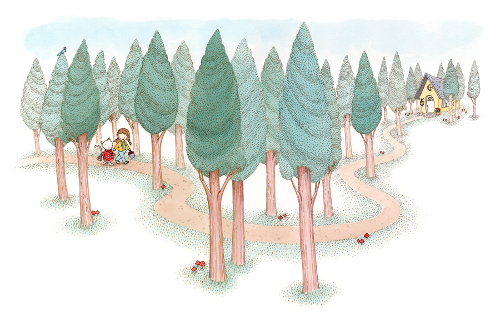 I’m starting on the illustrations for a picture book titled MORE!, written by Linda Ashman and published by Random House. 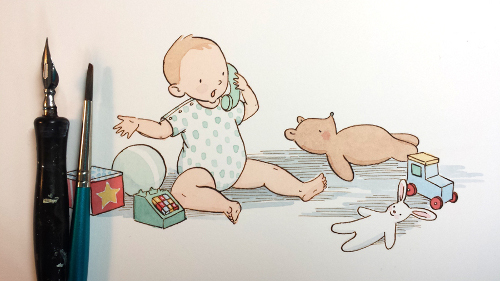 I’m also working on two book dummies of my own stories and am getting ready for this year’s SCBWI Summer Conference. 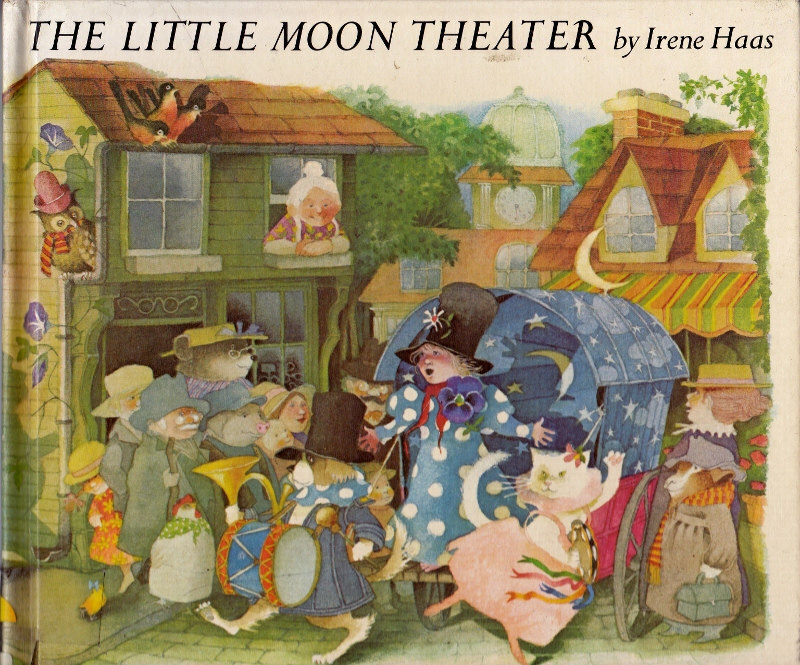 Some of my favorite books when I was little were The Little Moon Theatre by Irene Haas, Where’s Wallace by Hilary Knight, The Clown of God by Tomie DePaola, and The Grey Lady and the Strawberry Snatcher by Molly Bang. 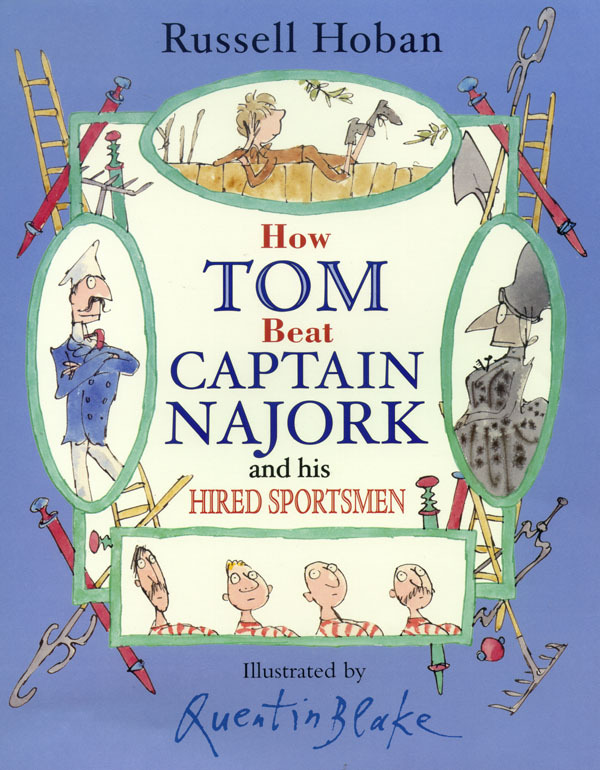 Oh, and I can’t leave out How Tom Beat Captain Najork and His Hired Sportsmen by Russell Hoban and illustrated by Quentin Blake! 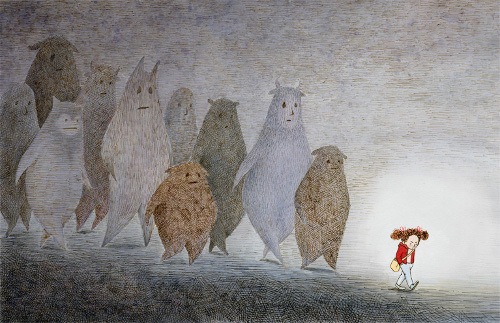 And just one more: Come Follow Me by Gyo Fujikawa. I spent so much time with that one that the binding broke and the cover fell off. Thank you so much for sharing my work, Jules! All images used with permission of Brooke Boynton Hughes. It was a distressing week in children’s lit, due to the very sad loss of Walter Dean Myers, and it was a distressing week for women’s rights in national news, so let’s work extra hard to find our kicks, shall we? 1) Though it’s challenging to get work done at home (since I always work from home) during the summers, I’m still enjoying more time with my girls — and especially more time for reading with them. 2) Remember how last week I was too tired to even leave kicks from re-organizing stuff in our home (mostly books)? Well, it feels good to be re-organized. 3) I love, in particular, what Sergio Ruzzier has to say in this interview about reading levels and children reading what they want. 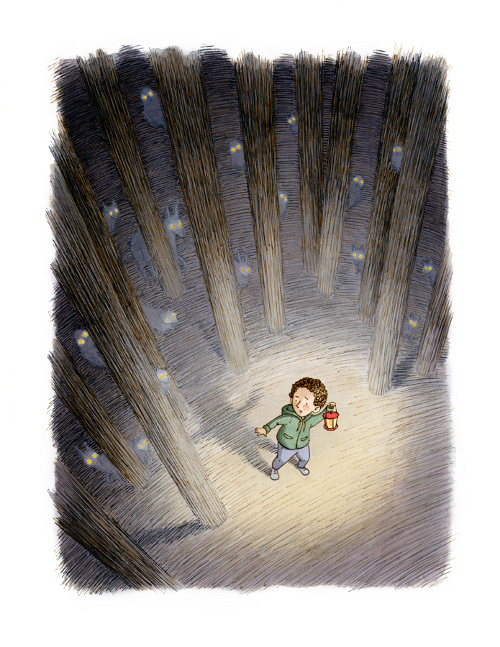 And the cover art is by illustrator Marcellus Hall! 6) Betsy Bird and I launched a website for our upcoming book, where we will share a story a day up until publication — stories, that is, which never made it in the book (but were in earlier drafts). Today’s story includes the best ALA conference photo ever. 7) I’ve lined up a book launch at Parnassus Books in Nashville for the book’s release, but I’ll try to remember to post about the website and the book launch here at 7-Imp tomorrow. 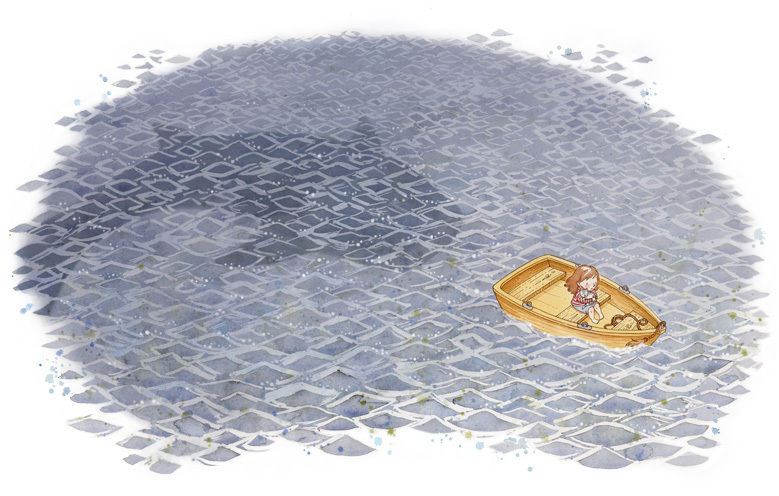 Wow, great new art today and extra recommendations too! I have missed being here on Sundays! Congrats on the website, Jules! Boo to reading levels, what a strange idea. And I admire your working from home. I do 2 days in the office and half a day at home, and the half day from home over the course of the rest of the week is a real challenge! 1. Baby music event at a children’s art festival last weekend – not sure the music part was necessary as the babies just loved hanging out with each other and crawling around the giant textured mat they had set up. 2. Had to cancel a weekend trip to see a friend and her new baby due to my baby being sick – only slightly so, but who want to give germs to newborns? But fortunately she is in in town next weekend so we can still catch up. 7. Farmer’s market today – stocked up on veg, bought a yummy baguette and enjoyed a good coffee. Ah, to be back on 7-Imp! 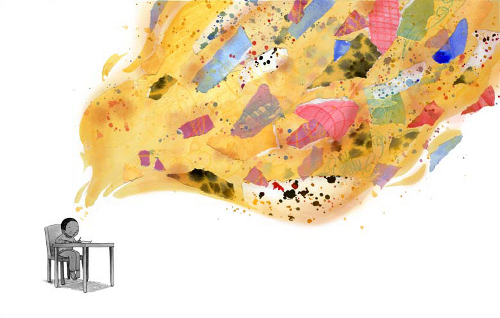 Brooke’s art is dazzling; it has such a sense of depth, and a delicacy of color. Along the deck, the stanchion holes of brass. Heedless from an overhanging tree. It makes a tighter, sounder craft than mine. It rounds a curve. I cart my skipjack home. Good morning. On the road literally on our way home from Idaho. Has a great rime. Will try to pop in later. 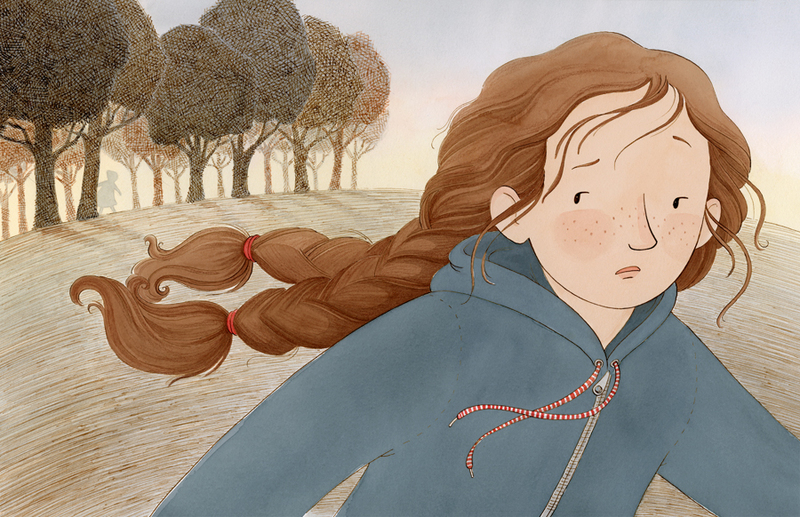 It’s so nice to see Brooke’s work here today. 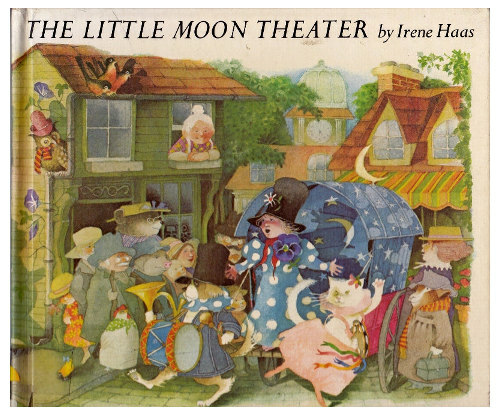 I love her fairy tale worlds that she creates. Jules – I love the new website. That Misty photo is so crazy. emmaco – I’m glad things are going well. Sorry to hear baby is sick. That’s always tough on mom too. Steven – Congrats on the collection and welcome to Cape Cod. This has been a busy week full of exhausting but good things. 7. All the while going to work and getting ready for my trip to Portland. Speaking of Portland, Jone and I are going to have an Imp meetup if any other PDXers want to join us, let us know. Follow me on twitter or Instagram to see how I’m doing at ICON. Fly-by posting to say hello to all Imps! 🙂 Will post kicks later tonight. Thank you Jules for highlighting Brooke Boynton Hughes here today and thank you Brooke for your conversation and artwork. It is absolutely charming with a wee bit of mystical magic to it. (I am a huge fan of The Clown of God too.) I look forward to seeing your books. I have major book relocation to do in my home Jules. I am looking forward to the relief you are currently feeling. I LOVE the website for your new book! Hope your baby is feeling better Emmaco. Farmer’s markets are the best. I would say you have huge changes in your life Steven. I wish you well on your move and the publication of your poetry collection. Model Ship and Maple Leaf is a splendid comparison. 1. They are finally finished putting in the new electrical line along my property. I see my watering efforts paying off in the form of grassy new shoots. Jules – congrats congrats! Love the website, and can’t wait to read all the stories. Any chance there will be a stop in Portland on the book tour? emmaco – sorry the little one is sick, hooray for catch-ups with good friends and cute dresses! Sending wishes for a quick recovery for the little one. Steven – congrats on leaving your job! And on the poetry collection coming in August! 1) Trip to LA last weekend – perfect amount of time to catch up with friends and enjoy the sunshine and beach. 2) Dodgers game at Dodgers Stadium. And they won! Total summer fun. 4) Tim Howard’s 16 saves in the World Cup game – amazing. 5) Late dinner and a catchup Thursday with 2 mentees/friends. Summer dining outside and Moscow Mules – yum. 6) Went to the 4th of July Portland Thorns game with a good friend visiting town, perfect weather, great seats, even better company. Then we watched the Brazil-Columbia game at a local pub. 7) Watched the fireworks from the Morrison Bridge with another good friend. Very full day. 7.5) World Cup fever. Goodness all the socializing that goes along with it can be exhausting – good thing its every 4 years! Bonus kick – going to dinner and a concert with a friend tonight for a late birthday celebration – my friends spoil me. Have a sun-drenched and happy week Imps! 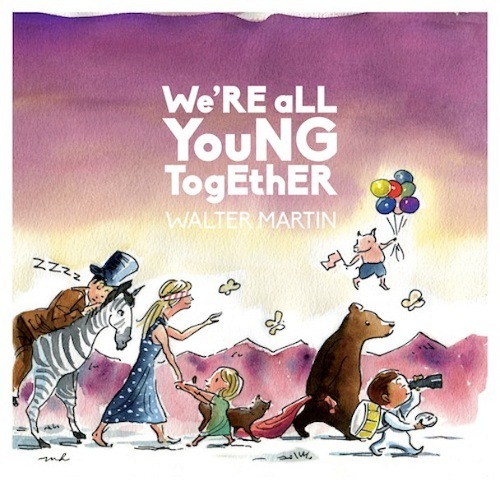 And oh, Jules — that Walter Martin video made my weekend. And the Wild Things Web site is shaping up great! Vicarious pleasures today from emmaco’s Down Under weather report; Steven’s self-confidence; Moira’s rainy cookout (I love rainy days); Little Willow’s winged shadow as she passes overhead; Margie’s Xena; an Rachel’s photographic treat at the Annenberg Space. 2. The wrong word, when it leads to surprising inspirations. 3. Belated b-day dinner of my own, with The Missus this week. 4. The X-Files episode “Jose Chung’s ‘From Outer Space'” (instant classic, and I think still hilarious). 5. Newly bathed and fluffy Pooch (although the scruffy version charms, too). 6. Recently finished a fascinating — really! — book on the “controversial” 1964 edition of the Merriam-Webster dictionary. What a wonderful new illustrator! We’ll be hearing more about her work in the future, I’m sure. Steven – here’s to confidence!! Congratulations. 1. Listened to the original London cast recording of Les Miserables with the volume way up…”Stars” is one of the best songs ever, and sung by a villain who thinks he is the hero of the story. 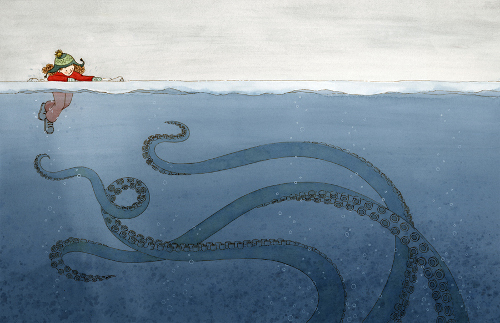 Love that kind of complicated storytelling. 2. Found Rainier cherries on sale and bought an armload full, had enough to share, ate them ice cold. DIVINE. 3. Same as #2 above, but this time it was raspberries – big, plump, juicy, picked ripe, sweet, sweet, sweet. 4. Sat on the shore at Lincoln Park in .west Seattle and watched the ferry boats to Vashon Island go in, out, in, out at the dock. sun on the water, Olympic mountains on the horizon. 5. Renewed my subscription the Sunday New York Times. A year of good writing from them, and great reading for me, guaranteed. 6. Got an Advanced Reader Copy of EVIDENCE OF THINGS NOT SEEN by the super-talented Lindsey Lane. Last saw it in manuscript form when Lindsey was my student at Vermont College of Fine Arts – so satisfying to know her talent is being recognized! 7. Turning 65 tomorrow, and my husband bought me a record player for my birthday!!! Listening to my vinyl LP’s – Bob Dylan, the Beach Boys, Otis Redding, the Temptations, the Lettermen…oh, heaven! Hello to Brooke Boynton Hughes and her cool illustrations! So happy to hear that you are doing what you’ve always wanted to do. 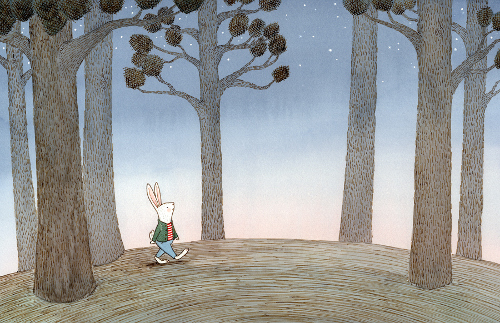 (And, as someone who thinks treehouses are neat and who thinks of the White Rabbit when I read “underground rabbit houses,” bonus kudos for those artsy early years.) Cupcake Cousins looks adorable. Congrats to you and your collaborators. Jules: Hugs to your girls & husband & cat! YEAH, Wild Things website! emmaco: Hope munchkin feels one hundred percent better soon. Yes to baguettes. Steven: A week of wows for you! Best wishes with the next week, and the next. Margie: Woo hoo to the new electrical line, the flowers, and, always, Xena! Rachel: Glad that you had a fun trip. Enjoy the spoils. JES: That’s a fun episode. Hola to the pup and ‘ello to the lady! Julie: Congratulations to your soon-to-be-published pal. HAPPY BIRTHDAY TOMORROW!!! I’m here! I’m here! Yesterday got away from me. Oy. Emmaco, so glad your adorable wee one is feeling better. I hope the virus goes away pronto. Steven, congrats! Wow, big changes ahead, indeed. Congrats on the upcoming book, and thanks, as always, for dropping off a poem. Margie, glad Xena is in good health. I love F&Gs, too, and I love saying “F&Gs.” Good luck to you with book moving-around. Rachel, I doubt I’ll talk about the book any places other than the South, but I’ll certainly let everyone know if that changes. And DANG, you’ve had a really fun summer. I want to come hang out with you. John. Alethia. Well, huh. I know an author with that name, but it’s spelled slightly differently. And oh my, that book looks so good. All pleasure reading for me right now has to wait till book promotion is done, but I’m adding it to the list. Julie, happy happy birthday! And congrats to your student. That has gotta be really great for you to see. Little Willow: Now I have to watch Out to Sea. Thanks for sharing kicks, you all! Like Julie, I was bummed by the SCOTUS news this week, but now I feel better. Sorry I’m late to the party. I love Brooke’s beautiful, evocative pictures and look forward to seeing her books!